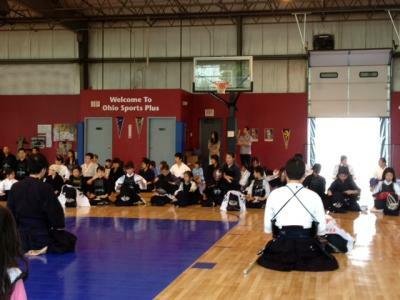 Today, we will look into one of the Kendo basics, Ashi-sabaki (Kando footwork). Footwork patterns called "Ashi-sabaki" are crucial for good Kendo movements. As the saying goes, "the ratio of handwork to footwork is 2 to 8." It is said that a master kenshi strikes not with one's shinai but with one's feet. There are several patterns to be mastered, but the two major patterns we commonly practice are "Okuri-ashi" and "Hiraki-ashi." Okuri-ashi is the most basic of all Kendo footwork. You use this step when you move forward or backward, to the right or to the left, ... in any direction. Suri-ashi (sliding your feet) must be used for this footwork. Therefore, you are not supposed to run noisily with your feet tapping or flapping against the floor. Your feet should smoothly slide, as if you slide on the ice, with your feet being always close to the floor and your body not going up and down. Suri-ashi is the footwork most suitable for Kendo, which requires busy and quick movements such as going forward quickly, striking and then moving backward immediately. If you just run, you may move forward quickly, but you won't be able to stop abruptly. When you do this footwork, or any footwork, it is very important that you keep your posture stable and hold your shinai at proper hight and in stable condition. Always be careful not to make your left fist (that holds shinai) loose when you move. Hiraki-ashi is used when you swiftly sidestep to avoid and counter an attack. It's important to turn to one side using not only your foot but also your hip. When you watch an excellent kenshi's movement, you'll notice how neat his posture is. Such a kenshi shows no useless movement in his or her footwork and swing of a shinai. This is possible because such a kenshi masters the basics of Kendo through his/her bodily experience. Let's practice the basics until your body memorizes the movement.